Latest installment of the adventure platformer that also took a first place spot for "Best in Show" at this year's NCFC 08. It's time to join Mario and gang again to embark on another quest to gather stars, pummel enemies, and restore order to the Mushroom Kingdom. I download it a long ago, in the Message Board. I cleared Bowser, got the yellow Star, and the game isn't finished. I killed all the bosses that I found : Gooper Blooper, Big Piranha, Crystal King, Tutan Koopa, Bone Kamek and Bowser. Please, tell me where's seventh boss ? What are you supposed to do after defeating the Blooper boss and the Piranha Plant boss? NikaB, you must give chip what you get from Gooper Blooper to green toad on left in toad town, He will do space ship, what will take you to Master Hand. What type is it supposed to be? (I'm really just a vistor I wont be makeing games untill I can find the right system for makeing games) It does the same thing to me and it's a .rar file? I don't yet know what a .rar file is but It doesn't semm to work on my computer. You need to install WinRAR to open .rar files. and where do you find this winrar installation? ok i found it: go to google.com then put winwar then click the 3rd winwar website that comes up then click on downloads then click on winwar 3.86 or somin, and well you guys know how to download. Hey thanks I'm going to see if it works, and also If anyone can help, I'm still trying to find a program that I can make games on that isn't to expensive, or thats free. Hey thanks again, and it works perfectly (with only 1 or 2 errors due to the fact my computers a bit old). And now I also know why other things on this website and on others don't work! Thank-you! Oh ! Thank you very much ! Don't try to go back to the tutorial once you've done it. That's a bug. The game is still missing a few minor plot details and the sidequest that would have utilized the shovel. I didn't have quite enough time to get those done, and I don't know if they are worth it at this point in time, because of how complete the game already is. I loved the first. I might like this. I'll download this now! 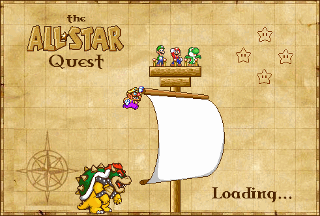 For some reason, after I left Yoshi's Island, I seem to be stuck, as in I can't move my ship. EDIT: I started a new file, went back to Yoshi's Island, and I can move my ship now. What probably happened is I moved to close to the island and therefore got stuck. I'd look into that glitch. ok theres one little problem with this game:it wont load my saved file! I checked and rechecked the save block and it works fine. Are you sure you are creating a savefile? The savefile would have shown up next to the game file. What do i do in the begining? Plus, why cant I beat the first boss? hmmm maybe im not saving it right? how do i accept saving progress the button z or c? I've founded a bug/error. If you are Wario, and you are in the place after the giant snowball, you can't continue because Wario can't hit the block that can reverse the spiked platforms. Why can't you go back to change your character after going to a boss!? I'm Yoshi against the Ice King, and I saved, so I'm stuck with him to fight against the snowmen that immediately fling me across the entire area. How do I use the shovel or play in the arcade? Omgee I love this game! I downloaded it on my new (but outdated) compie but it was so slow that I had to take it off. My dad is a computer techie so we have 7 or 8 computers in the house. The game runs on them, but my siblings hog it up and finish bosses and stuff without me so I took it off :P I think I'll try re-downloading it on mine... Maybe the new year will smile on me and I will have luck with it this time. true. i tried mario with iceking,lost like 50 times until i won. well i did find somin out. when i put it to windowed form and go to save then i dont see a save file come up. Go to the FAR RIGHT of the town, and keep proceeding. It seems he forgot an arrow. I won against Masterhand and then an error came up. The background has changed but nothing else happened. But else a very fine game. I am stuck on the Ice King! The sounds and music are great, the ingame are too. this is a very good game, man.